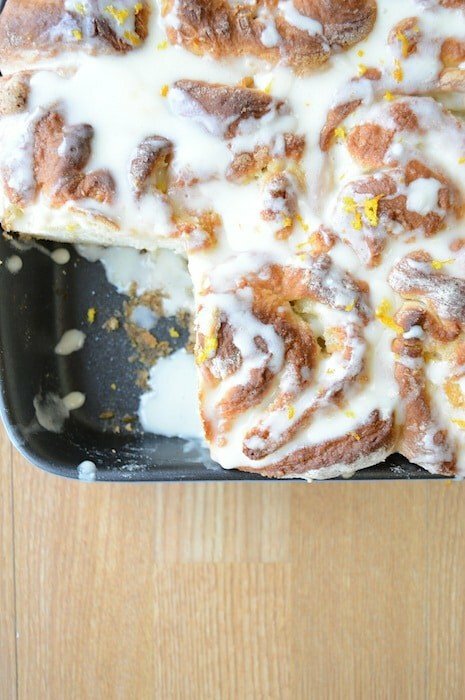 I’ve made homemade cinnamon rolls before, and that wasn’t too hard, so I thought I’d try my hand at orange sweet rolls. They turned out to be more like GIANT orange sweet rolls. Like billowing out of the pan & how do I fit this in my mouth GIANT. No one really minded their extra large size – it meant more deliciousness for breakfast. I’m a novice when it comes to baking with yeast. So I did a little pre-reading about how to work with yeast before I started. 1. Your yeast needs to be fresh – so about less than 4 months old. 2. Yeast needs a warm, draft-free place to rise. I turned my oven on to 150 degrees F for 3-5 minutes. Then I turned it off, waited several minutes and than put my dough in to rise. 3. Yeast likes warm water, not hot. I didn’t use a thermometer, just used my best judgement between warm and hot. 4. Your dough may be a little sticky, and that’s fine. You want to add flour to your yeast mixture just until the dough is slightly pulling away from the sides of your bowl. If you add to much flour it will result in dry dough. 5. Let the dough rise in a large bowl (like very large bowl unless you want to clean up a spilled over doughy mess). Spray the bowl with cooking spray and if you’re covering it with plastic, spray that too. Now we’re all experts in yeast – ha, yeah just kidding – I was the one who googled “baking with yeast for dummies”. Ginormous, right? What can I say, they were a lot bigger than I expected them to be! And in comes the flood of orange glaze! Preheat oven to 150 degrees F for 3-5 minutes, then turn it off. You want a warm oven to help the dough rise. If you choose not to use your oven, pick a warm, draft-free place. In a bowl, combine the warm water and yeast. Allow it to sit for 5 minutes until yeast begins to bubble. Add the honey, melted butter, salt and eggs. Use a whisk to combine. Slowly add 4 cups of flour and mix/beat to combine. Mixture will be wet. If you have a stand mixer, you can use the dough paddle. Add 1/2 cup of flour at a time until dough pulls away from sides of the bowl but is still slightly sticky. This will be a wet dough, so don't add too much flour. Your finger should stick to the dough but shouldn't pull any dough away with it. Put the dough in a large bowl, sprayed with non-stick spray. Cover with plastic wrap and place in the warm oven. (Oven should be off). Allow the dough to double in size, which will take about 45 minutes. After the dough has risen, knead it and roll it in to a large sheet, approximately 16x24 inches. Spread the filling (see below for instructions) over the dough, then tightly roll into a jellyroll, rolling the long side around itself. Using a sharp knife, cut it into 1-inch pieces and place them into a buttered 9x13 pan. Drizzle glaze (see below for instructions) over the top of the warm rolls. For the filling - combine all the ingredients in a small bowl and mix. Spread evenly over rolled dough. 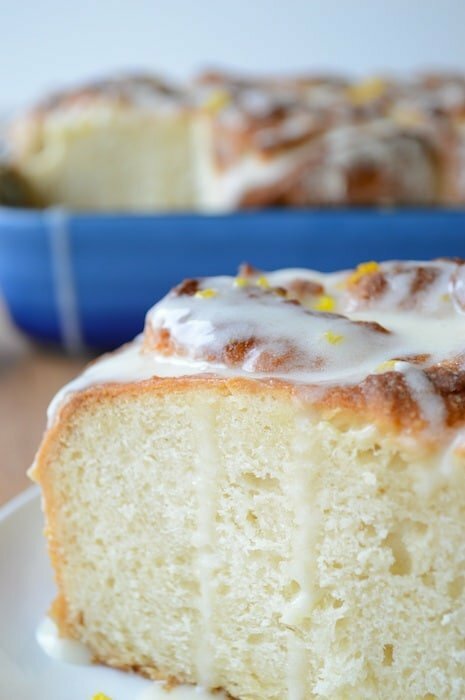 For the glaze - combine all ingredients until smooth. Glaze should be thin enough to pour, but thick enough to coat the back of a spoon. Perfectly soft, sweet and orangey! But not too orangey for those non-orange likers out there – be adventurous and give them a try. 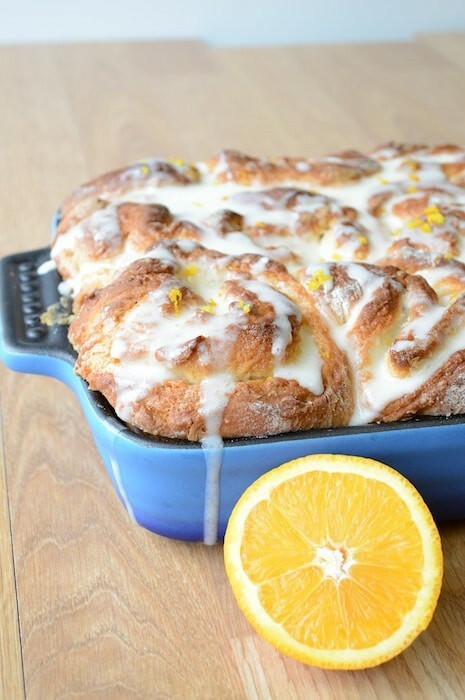 Top these sweet rolls with orange zest and serve with a side of glaze – ta da, a breakfast of champions! I think, from the pictures, that you did a wonderful job working with this yeast dough. They look so delicious that I’m saving the recipe for a Christmas breakfast. Just to check – is the amount of yeast in tsp or tbsp? Thanks! Hi Maureen! Thank you! The recipe calls for 3 packets of yeast (.25 oz each) which turns out to be exactly 2 and 1/4 tbsp. Oh my gosh. That icing dripping down over the sides of your dish make me salivate. So yummy! Hahaha, thanks for coming by Lauren! You did an excellent job and they look absolutely delicious. Wow these look really delicious! pinning this! And so gooey and warm and delicious!! Beth, these look so good! I love fruit and pastry, and I’ve never tried any orange flavors with my pastry. Gotta give these a try! Thanks for the great idea! They look beautiful, just love the flavors that go around it. I am glad I am following your blog, you have some great stuff here. Aww Ash, you just made my day!! would ♥ to have you help spread the word re: my brand new etsy shop just opened! Thanks friend! I’ll stop by your page and take a look! Oh Yum! Those look mighty delicious! Thanks for coming by Lisa :-) Have a great Tuesday! Hi Beth! 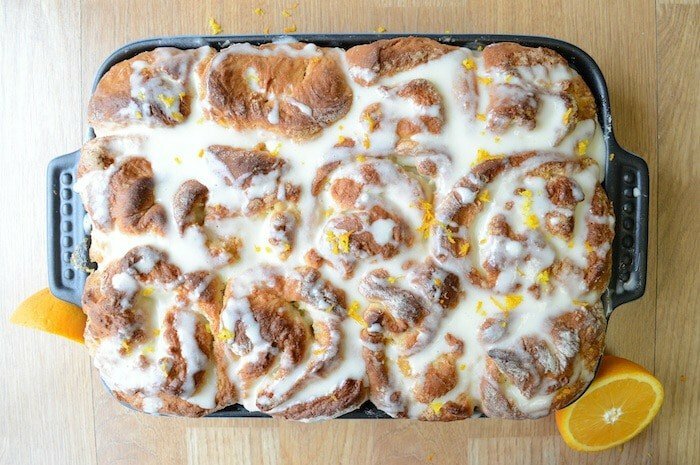 These are ginormous orange rolls and they look so yummy! Thanks for sharing the recipe! Blessings from Bama! Have a great evening Felecia! Hi Erin! I will definitely come by! How how lovely! I just LOVE citrus, whether it’s lemon, lime, orange…these just look amazing…beautiful photography! Found you at Creations by Kara’s Linky Party! Thanks for your kind comment Rhonda! 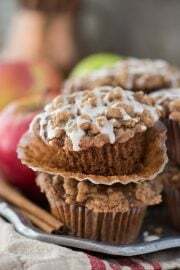 My husband and son will love you for this recipe if I try it! I usually buy the canned version from the dairy and they are fine with that but these……I want to eat them! Pinned! Visiting from The Scoop! Those are some lucky guys you have, I hope everyone likes them! Oh my goodness, Beth! These look amazing! Thank you so much for sharing them at Wake Up Wednesdays! Pinning! Oh my goodness, do these look amazing! Visiting from All Things Thursday. Pinned. Oh my word, these look absolutely delicious. My mouth is watering looking at these pictures! Thank you for sharing the recipe and for linking up to Thrifty Thursday. These look incredible and thank you so much for putting the actual amount of yeast you need in there rather than just three packets. And thanks for linking up to the Weekend re-Treat Party. 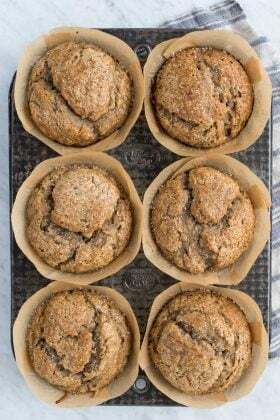 Pinning these for Sunday morning breakfast. You are very welcome Britni, glad that helped you! Let me know how they turn out! :-) Happy Friday! 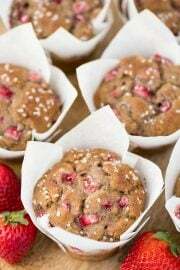 These look gorgeous and sound delicious! I’m pinning to try later. Have a wonderful weekend! Enjoy your weekend too Nici! Oh Kat, thank you for coming by to leave a comment! How pretty and delicious looking. I love that blue pan too! I have some pumpkin spice cinnamon rolls still hot from the oven and just tried to take some photos of those. Your photos are MUCH more incredible looking and I’m pinning this recipe stat. 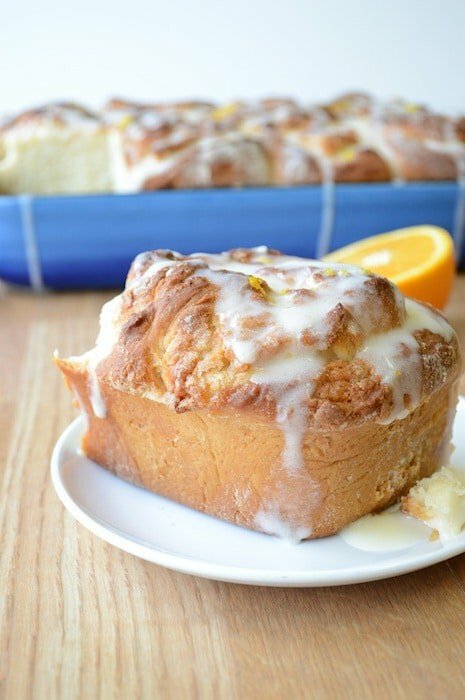 I just can’t get enough of sweet roll goodness, especially on a Sunday morning. 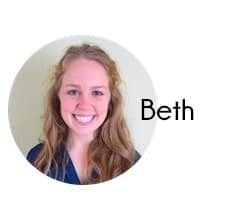 Thank you for sharing, Beth. Pinning stat!! Hi Jelli! 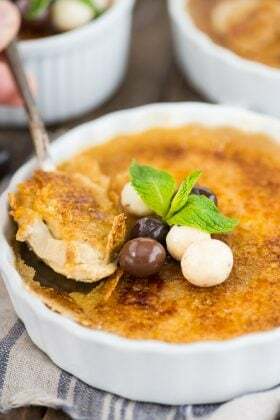 Thanks so your kind comment, and for pinning this recipe! I want to try these they sound so good. I found you thru Create. Craft. Love. Thanks for coming by Marlene! No one in my home will be complaining about extra big sweet rolls! These look delicious. Thank you for linking to the In and Out of the Kitchen Link Party. I look forward to seeing you next week. These look fantastic! I have made numerous batches of Cinnamon Rolls (which I love) and very much looking forward to having a go at these beauties. Found you via Sweet Sharing Monday. Have a great week! These are big and orangey and so so good! Enjoy! These look so good! 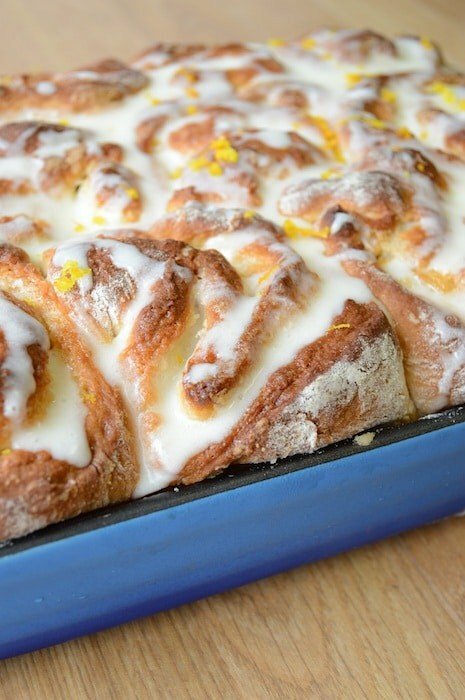 Sweet rolls are a favorite in our home. Stopping by from Inspiration Monday. Thanks for letting me know where you are coming from! These look incredible, Beth! 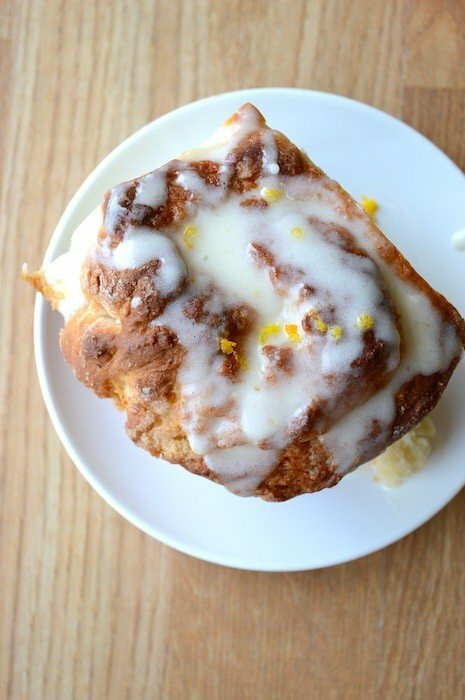 I’ve had orange cinnamon rolls before & they’re really good—now I’m craving some! Thanks for sharing this with my Frugal Crafty Home readers! Have a wonderful day Carrie! Thanks for coming by to comment! 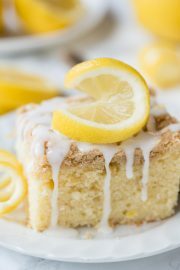 Beth- Would love for you to link ANY OF YOUR AMAZING RECIPES to http://imnotatrophywife.com for Favorite Fridays! I got lost in your blog just clicking on each photo/recipe! We love chemistry majors !!!! Found you at Kitchen Fun with My 3 Sons. These sound great. Makes me long for Florida, and sun, in the midst of all this winter :) Going to try! 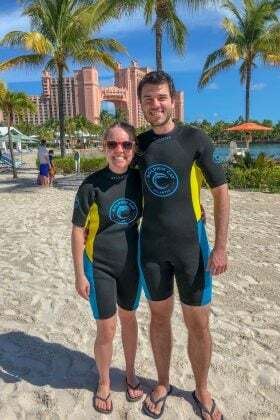 Haha, makes me long for Florida too being in central cold/snowy IL! Your recipes always look so amazing! 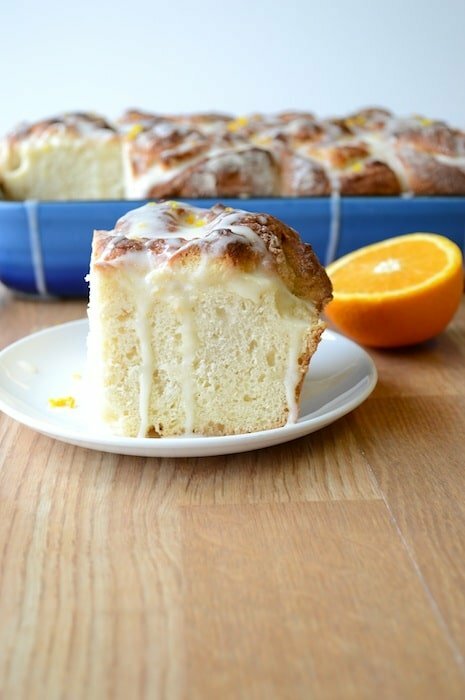 Orange sweet rolls are so yummy! I love the pan these are in! Hi Heather! Thank you so much! I inherited this pan from my aunt and I love the color! Oh yes, a must for Sunday breakfast! Wowie! Those look like heaven. 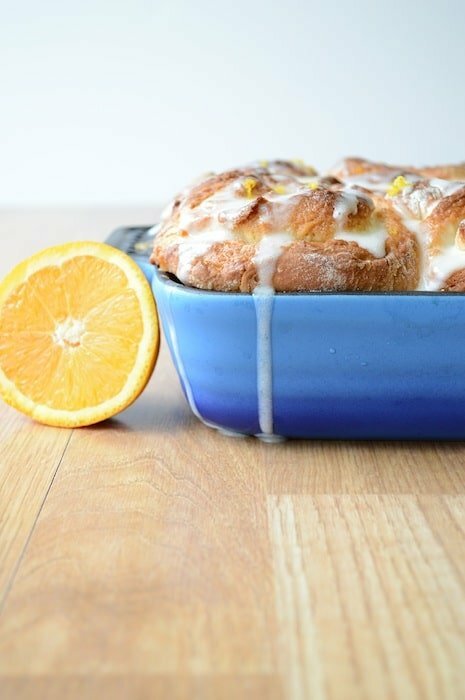 I’ve made a few variations of sweet rolls in my day but never orange. Gonna have to try these… soonish. 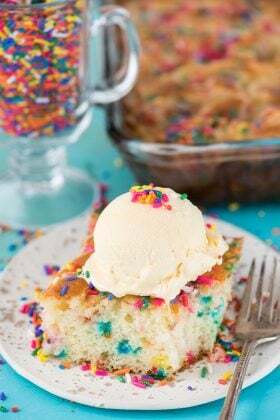 I’d love it if you would link this recipe up at my Pinterest Link-up Hop sometime!